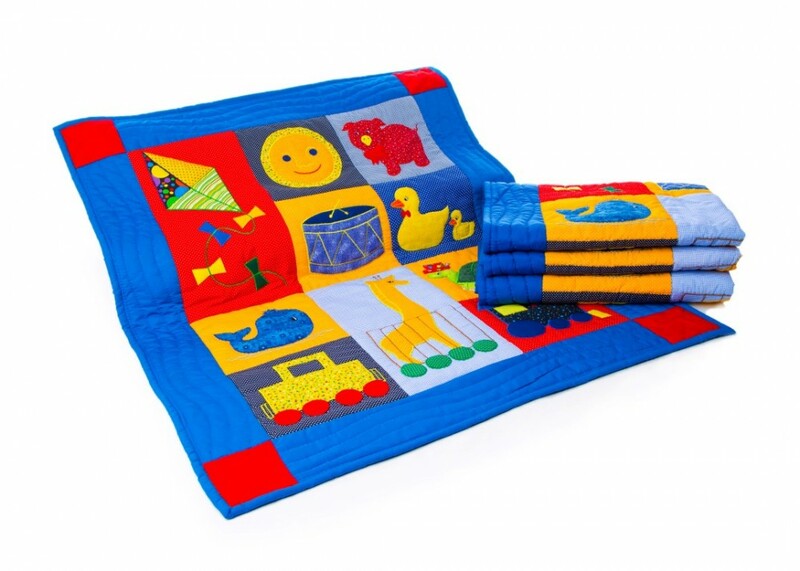 Bright and colourful, this fun Favourite Things baby quilt will brighten up any nursery. We call it Favourite Things as all the designs on the front are just what every little child would love as their favourite thing to play with!. 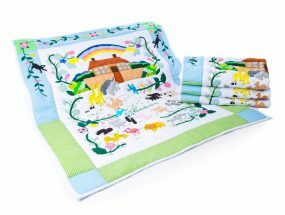 It doubles up as a playmat to put on the floor to lay your baby on, a colourful wall hanging for your nursery wall, or as stated – a Baby Quilt! It also looks great laid out on a single bed on top of a plain bedspread. Our primary coloured Favourite Things baby quilt has a plain blue back to match the blue on the front and measures 120cm x 98cm. All the pictures are appliqued onto the fabric and then hand sewn around. The lovely border is also hand quilted. Machine washable but not recommended for tumble dry. As with all our quilts this one is handmade in the Philippines by a very talented and lovely bunch of ladies that we have been supporting for over 30 years.